This three-quarter length kimono-style jacket originated in the 20th century as an over-kimono coat that was worn for extra warmth and/or protection while out and about. 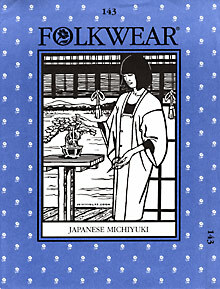 Its low, square neckline was designed to attractively frame the overlapping neckbands of the kimono and under-kimono worn underneath. Today, the Michiyuki is also worn as a dressy overcoat, casual coat-dress, and artist's or work smock, perfect for studio or gardentasks. Lengthened and made out of water-repellent fabric, it also functions as a raincoat. The pattern features a double-breasted front opening, kimono-style sleeves that are large enough to fit over a kimono underneath, narrow neck band with mitered corners, and a handy pocket hidden in the front seam. Covered butttons are decorative only; snap fasteners attach the overlapping center front panels, so no buttonholes are needed. Misses Extra Small through 2XLarge.